The following is a press release from the Miami Dolphins. 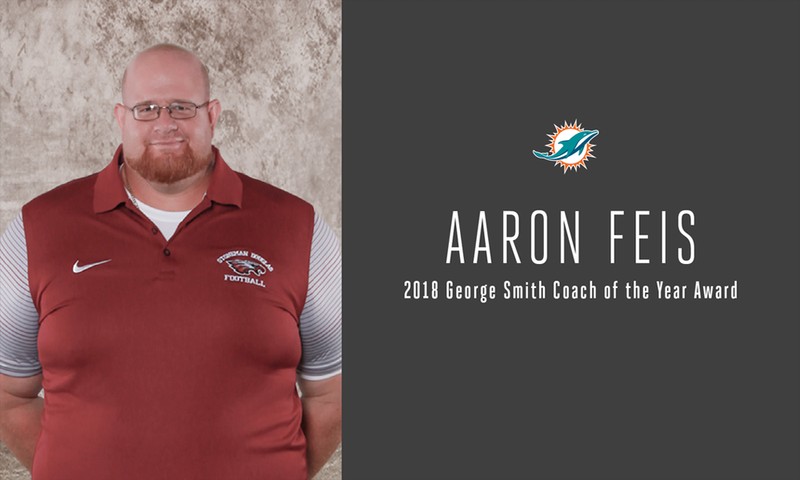 MIAMI, Fla. – The Miami Dolphins announced Marjory Stoneman Douglas High School Assistant Coach Aaron Feis as their George F. Smith High School Coach of the Year. Feis tragically lost his life protecting students during a mass shooting on February 14th. The Dolphins posthumously honored Aaron along with his wife, Melissa, and daughter, Arielle, on the field during their home opener against the Tennessee Titans. The Stoneman Douglas football team also were the Dolphins team of the week and had the opportunity to stand on the sideline during the national anthem. This offseason, the Miami Dolphins have continued to support the Stoneman Douglas community and provide solace through sports. Outreach has included financial support to the victims and families of the shooting, visits with five survivors by Dolphins players, alumni and senior leadership, a free football clinic for Parkland youth, inviting seniors of the Stoneman Douglas football team and members of the Feis family to announce selections on day three of the 2018 NFL draft, an invitation for the Stoneman Douglas soccer teams to attend the Peru vs. Croatia match at Hard Rock Stadium, Stoneman Douglas T-shirts worn by Dolphins players and staff that were also given to the Stoneman Douglas football team, inviting the Stoneman Douglas football team to a Miami Dolphins practice and attending the Stoneman Douglas football home opener vs. South Broward High School.